Holidays are a time for giving, but sometimes it is hard to find the perfect gift for those who are not in your family or a close friend. Whether you are getting a gift for a new neighbor to welcome them to the neighborhood, you want to get your receptionist a gift, or you are headed to a holiday party and don’t want to show up empty handed, Nancy’s Floral has what you need. Our Portland flower shop has more than just flower bouquets. We have gift baskets and other items that can make the perfect gift for some of the people on your list. If you are looking for a gift basket for your neighbor or to bring to a party, be sure to shop Nancy’s Floral today! Let’s take a look at some of the gift baskets we offer and why they make the perfect holiday gift. This gift basket is full of everyone’s favorites. From kettle corn, cookies, toffee, and chocolates, this gift basket will keep everyone happy! This is the perfect gift basket for families because there are so many different goodies in it, allowing everyone to find something they love. Who doesn’t love popcorn? 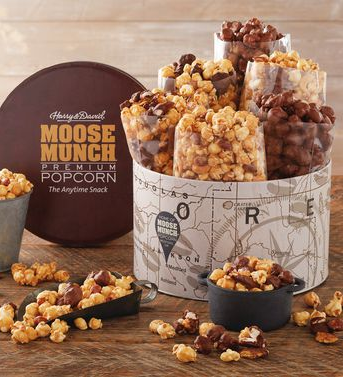 This popcorn tin is full of delicious popcorn that is not your average caramel popcorn. This tin comes with six bags of popcorn, all different flavors. The flavors include milk chocolate, dark chocolate, classic caramel, milk chocolate covered, dark chocolate covered, and milk chocolate s’mores. Whoever you give this popcorn tin to will love the variety of sweet treats during the holiday season! If you want to really wow your neighbor or co-worker, get them this ultimate gift basket! It includes a little bit of everything. From fruit to crackers and cheese to chocolate, this basket has something for everyone. This basket includes sweet and savory options that will be a hit at the next holiday party. These are only a few of the many gift baskets we have to offer. Whether you pick one of these awesome gift baskets or you find another option that we offer, you can’t go wrong with giving the gift of a basket full of goodies. Nancy’s Floral can provide you with the gifts you need.